This enticing blend of Chardonnay and Pinot Noir shows elegant fruit underlined by firm acidity, with with a delectable full mouth feel and balance. An unwooded Chardonnay blend rounded off with Pinot Noir. Chardonnay contributes freshness and finesse to the blend while the Pinot Noir provides body and structure. Expect citrus fruit underlined by a firm acidity. You'll find an abundance of white peach, citrus, lychee and red fruit on the nose with a delectable full mouthfeel. Achim bought a second property, aptly named Haute Cabrière. The philosophy and speciality is producing wine exclusively from Chardonnay and Pinot Noir. The iconic Chardonnay Pinot Noir blend was a South African first, leading the market in a blend of these varietals. 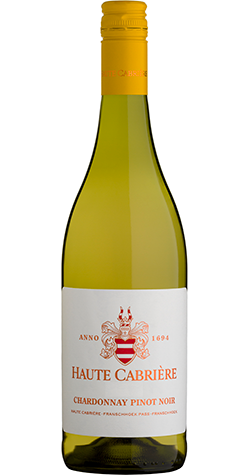 Currently overseeing the wine-making is 2nd generation Cellar Master, Takuan von Arnim. He shares his father’s philosophy of the importance of terroir and the passion for Chardonnay and Pinot Noir.